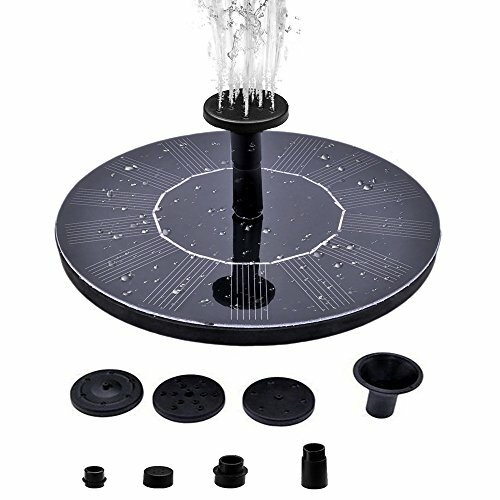 Solar Birdbath Fountain, Supmovo Solar Fountain for birdbath, 1.4 W Solar Panel Water Pump Kit, Solar Powered Birdbath Fountain Pump for Garden and Patio, Free Standing Fountains for Garden Pond | Fountain City Art Ctr. 2. Put it on the water with its nozzle over the water and make sure that the solar panel is not sheltered from the sun, face directly to the sun. Supmovo solar birdbath pump is made up of highly efficient solar panel, efficient and strong stability. This solar fountain pump kit can aerate the pool to increase the pH of water and keep water circulating to improve pond and fish life. The Power of Pump: 7V,1.1W. Minimum water depth in fountain should be 1 3/4"
1. Put the solar panel under enough sunlight and be better to face directly to sun, it will work continuously only when the sunlight is enough. As the power of the solar panel is depended on the sunlight, the pump is also affected by weather, seasons, places, etc. 3. Be careful to project the solar panel to avoid any damage. 5. Be careful when using it. And don't let children play with it. 6. The birdbath and birdbath stand are not included. 1. Shadow the panel for 8-10 seconds. 2. Press the panel fully into the water, then release. Eco-Friendly and Wireless: It is made up of highly efficient solar panel. Wireless, no battery or electricity needed. Runs off the sun's energy. Please note：t will work continuously only when the sunlight is enough, because it dont include battery. Easy to install and use: Just put the solor panel under the enough sunlight, the fountain will automatically work. Design lightweight, easy to install, easy to operate, strong. Convenient and compact: Easy to move, Easy to clean. Easily move to different locations, no plugs required. Multiple fountain heads for different water patterns. If you have any questions about this product by Supmovo, contact us by completing and submitting the form below. If you are looking for a specif part number, please include it with your message.